Although his New Zealand sojourn lasted for only sixteen months (from March 1855 until July 1856) William Strutt was certainly the most competent professional artist to visit this country in the mid-nineteenth century. Born at Teignmouth, Devonshire, in 1825 into an artistic family, Strutt received his first drawing instruction at the age of twelve from a tutor in Boulogne, France. In 1838 he entered the Paris atelier of Michel-Martin Drolling, a history painter; and the following year he was admitted to the Ecole des Beaux-Arts. From 1843 he worked in the atelier of another history painter, Joseph-Nicholas Jouy, returning to England in 1848. 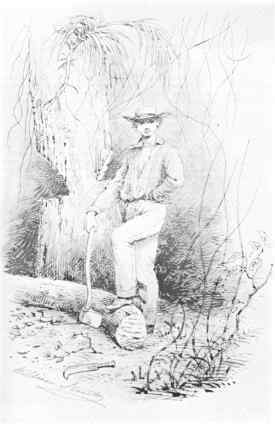 At the time of his arrival in Melbourne in July1850 Strut had intended to try life in the bush: but instead he found a position as an illustrator on the Illustrated Australian Magazine, published by the Ham Brothers, a firm of lithographers and printers. He also painted several portraits, depicted political events at the beginning of Victoria's history as a separate colony, and in 1852 visited the gold fields at Ballarat. pen, ink and wash, 230 x 267 mm. Strutt's earlier ambition was not to be realised until 1855 when he landed in Nelson, New Zealand, with his wife and young child on the schooner Marchioness. 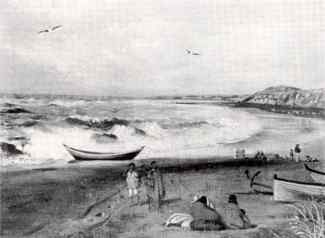 (2) Two weeks later he arrived in Taranaki,(3) and purchased a 100 acre block of land, ten miles from New Plymouth. With the help of friends, Strutt cleared and burnt off a section and established a neat little bush house and garden. His pioneering progress is recorded in a series of precise drawings (in his albums in the Alexander Turnbull Library). It was in this bush house that his son, Alfred William, was born in January 1856. Strutt painted seven known oils of New Zealand subjects. As they have now all been located, they are reproduced together for the first time as illustrations to this article. This is all too true: for although the mountain appears in the background of several of Strutt's New Zealand paintings, he never managed to convey the mystery and sublimity of Mount Egmont - which had been captured in a watercolour by Charles Heaphy, artist and surveyor to the New Zealand Company fifteen years earlier. oil on board, 130 x 175 mm. The painting was exhibited in the Victorian Picture Gallery, in Collins Street, Melbourne, in December 1861. In the five years after his return to Melbourne from New Zealand, Strutt was also commissioned to paint the portraits of several prominent Melbourne citizens. He was on the committee of the Victorian Society of Fine Arts, which held its first and only exhibition in December 1857; and in 1860 he made drawings of the departure of the Burke and Wills' Exploring Expedition from Melbourne: In 1861, after the news of the death of Burke and Wills reached, Melbourne, Strutt gathered eye-witness accounts and made preliminary studies for a reconstruction of The burial of Burke, a large oil which was not completed until 1911. In January 1862, after completing a full-length posthumous portrait of Robert O'Hara Burke, Strutt returned to England, where he pursued an active painting career until his death at Wadhurst, Sussex, in 1915. From 1865 until 1906 he exhibited a wide range of subjects with the Royal Academy and the Royal Society of British Artists: religious works, genre, animal paintings, together with exotic and classical subjects. He was most admired for his paintings of lions, for which he made many studies at the London Zoo and the Menagerie at Margate. Most of Strutt's best-known colonial paintings were also completed after his return to England, including three New Zealand subjects. 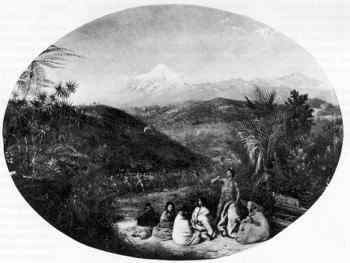 In 1912 this painting, together with Taranaki [showing Mt. Egmont. . . ] 1856 and Strutt's New Zealand drawings, was purchased from the artist by Angus and Robertson; and the following year acquired by the Wellington collector Alexander Turnbull. 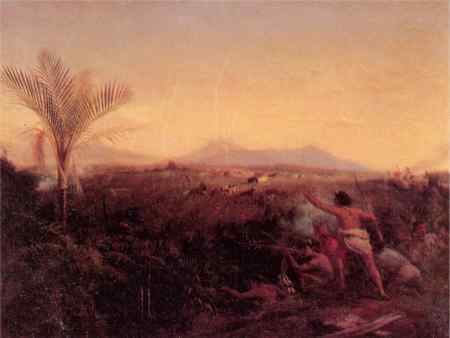 The last recorded New Zealand painting by Strutt was An ambush, New Zealand, 1859, which was exhibited with the Society of British Artists in London in 1867. This is probably identical with a small oil entitled Maoris in ambuscade. (Now in a private collection, this painting was purchased in London in 1968, incorrectly attributed to Gottfried Lindauer, and was correctly identified as the work of Strutt by Hamish Keith, then Keeper at the Auckland City Art Gallery. Figure drawings in the Mitchell Library, Sydney, and the National Library of Australia, Canberra, conclusively support Mr. Keith's re-attribution.). oil on canvas, 332 x 708 mm. 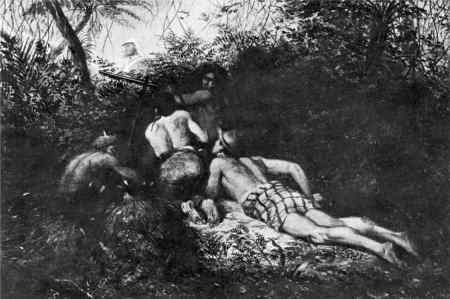 Five fierce Maoris crouch and lie in a small clearing in the bush, preparing to ambush a passing soldier. This was probably a reconstruction of a specific incident, of which Strutt was informed after his return to Melbourne. It is interesting that three of Strutt's New Zealand paintings show the Maori in his more warlike aspect. In his autobiography the artist had mentioned the hostile behaviour of the Maoris in the Waitara district; and his albums in the Alexander Turnbull Library include a drawing of a carved pole, Te pou Tutaki, or Fitzroy's pole, which had been erected in 1845 by the Maoris to define for the Europeans the boundary of permitted settlement. Contemporary depictions of New Zealand colonial events are rare. It is fortunate that these few examples by an artist of Strutt's calibre still exist. He is well-known in Australia for his epic painting of Black Thursday (1864, La Trobe Collection, State Library of Victoria), a tableau depicting settlers and animals in flight from a bush fire which destroyed large areas of Victoria in 1851; for his Bushrangers, Victoria, Australia, 1852 (R.A.1887, The University of Melbourne, Russell Grimwade Bequest), a reconstruction of a hold-up which took place on the St. Kilda Road near Melbourne in 1852; and for a large oil painting of The burial of Burke (1911, La Trobe Collection, State Library of Victoria). Twentieth century interest (like colonial taste) has until recently been directed towards the representation of landscapes rather than incidents. It is only in the last decade that Strutt has been acknowledged as one of the most important, and certainly the most accomplished painter to visit the colonies in the mid-nineteenth century. By the use of classical poses and compositional formulae that derive from his academic training, he invested his subjects with a dignity which elevated them above the level of mere genre painting. Most of his works are composite productions, carefully assembled out of detailed studies made from nature. It is this concern for accuracy (for example in the costumes and botanical embellishments of his New Zealand subjects) that gives them that authenticity of time and place so important to the academic history painter of the nineteenth century. 1. An account of William Strutt's life in Australia and New Zealand may be found in The Australian Journal of William Strutt, A.R.A., 1850-1862, 2 volumes (edited by G. Mackaness), Sydney, Halstead Press, 19S8. 2. Nelson Examiner, 17 March 1855, lists Strutt among the passengers for Nelson who arrived on the Marchioness on 14 March. 3. Taranaki Herald, 28 March 1855, lists Mr and Mrs Strutt among the passengers on the coastal steamer Nelson, which arrived in New Plymouth on 27 March. 4. Daily Southern Cross, 8 July1856, lists Mr Wm Strutt and 2 children among the passengers on the William Denny, which sailed from Auckland on 4 July. 5. 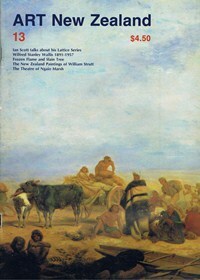 'Autobiography of William Strutt, 1850-1862', pages 80-81. Typescript, NK 4367, National Library of Australia, Canberra. 6. Information supplied by a descendant of William Strutt. 7. Illustrated Journal of Australasia, January 1858, page 37. 8. Printed notice of Art Union of works by Strutt, on view.at Norton's. On verso of Acc. R3852, National Library of Australia, Canberra. 10. Copies of the photographs by Bambridge and Mayall are in the Alexander Turnbull Library. 11. 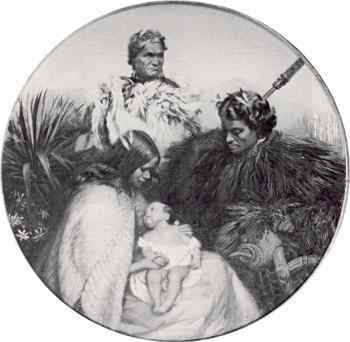 For a full discussion of the iconography of this painting, see: Leonard Bell, 'The making of a portrait: William Strutt's Hare Pomare and Family, 1863-64', Bulletin of New Zealand Art History, Volume 6,1978, pages 31-39. 12. See: Heather Curnow, 'Notes on a New Zealand painting by William Strutt (1825-1915)', Turnbull Library Record, Volume 9 (n.s.) number 2, October 1976, pages 22-23. 13. 'Autobiography of William Strutt, 1850-1862', page 115. Typescript, NK 4367, National Library of Australia, Canberra. oil on canvas, 280 x 420 mm. Heather Curnow is a free-lance writer who specialises in the fine arts (particularly in colonial painting). Her monograph on The life and art of William Strutt will be published in a limited edition by Alister Taylor, Martinborough, later this year.